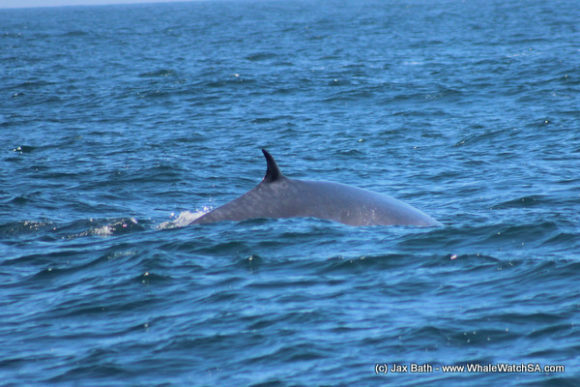 Today’s trip was an exciting one filled with some unusual sightings. Our first animal of the day came in the form of a Sunfish or Mola Mola. We had been cruising all along the shallows and had almost reached the shark cage diving vessels before this not so little guy decided to pop up. These strange creatures hold the title for the largest bony fish in the world and are quite a sight to behold given their unusual look and swimming style. We watched him for a couple of minutes before he disappeared into the depths after which we made our way towards our sister company’s boat. 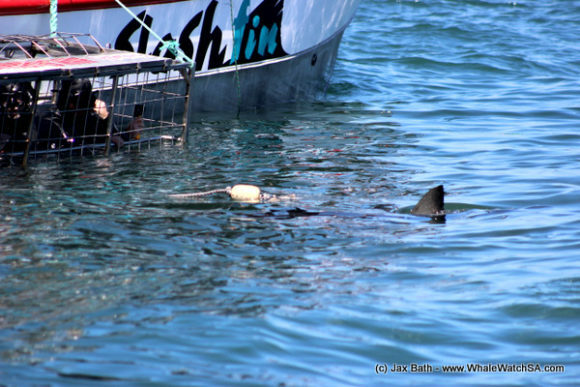 On the way, we managed to spot a free swimming Great White Shark and then two more at our diving vessel. One of the sharks came up for the bait a couple of times, exposing his beautiful dorsal fin for us before he decided that the bait was not all that fascinating. This was our cue to head towards Dyer Island where we managed to see the Cape Cormorants flocking in all of their splendour. It appeared as though they were returning from a fishing expedition, flying in their tell-tale V-shaped formation. We also had a look for our African penguins which were a little tricky to see on the island. Our next stop was Geyser Rock which was exceptionally devoid of seals today. Having said that, there were still enough of these adorable little sea lions for us to have a great viewing session. 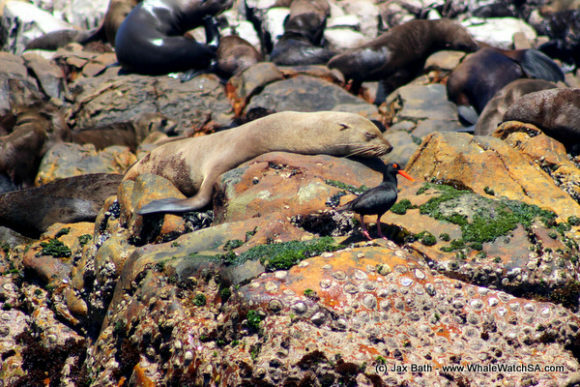 Having so little seals around also gave us the opportunity to look at them as individuals and I was lucky enough to snag a photo of a sleeping seal with a Black Oystercatcher just below it, which is a pretty exciting shot for a seal lover cross birder. 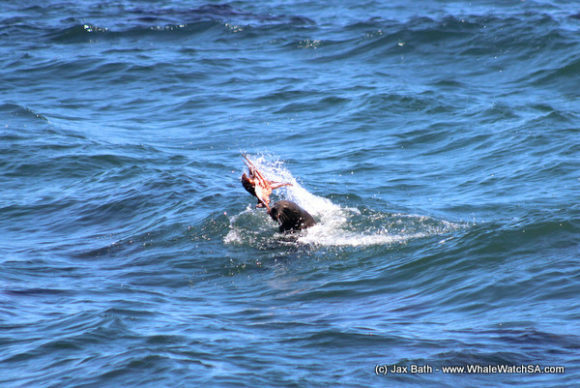 Our next sighting was of a seal devouring an octopus which was a truly awesome sight. Seals tear their prey apart by shaking it violently and this adorable predator looked like he was having a ball throwing his Octopus around in an attempt to break off digestible chunks. 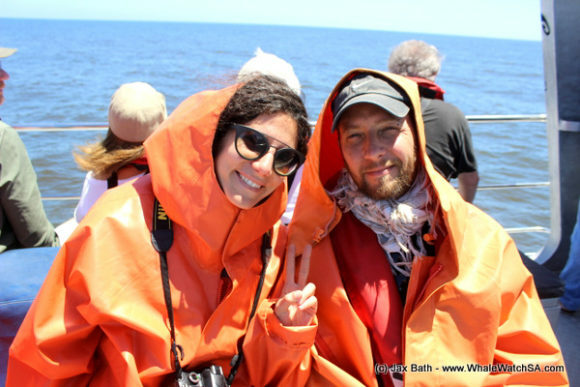 We were fortunate to have spotted a carefree Bryde’s Whale in the open sea after this, the whale even swimming on its side to expose its beautiful white stomach to us. A notoriously shy species, the crew were ecstatic as the whale swam very close to the surface giving us ample photographic opportunities. 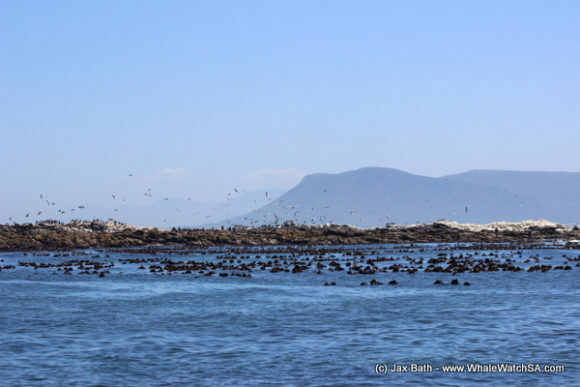 The trip was perfectly concluded with a beautiful African Penguin sighting in the water, a couple of Cape Gannets in the air and a beautiful view of Gansbaai Mountain as we head back towards the harbour. 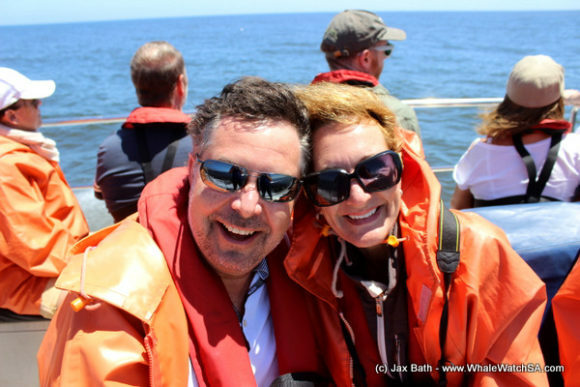 On a side note, the red tide in the bay was very prevalent today as we made our way from the Island towards Kleinbaai. Although a completely natural occurrence, we do hope that it clears up soon due to the possible effects that it may have on the areas shellfish.